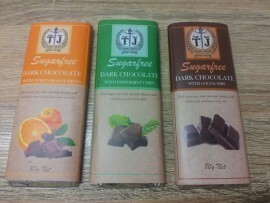 TJ (TREATS JUSTICE) is an affordable range of Aussie Made guilt-free range of chocolates with a host of benefits. The Sugarfree range includes DARK CHOCOLATE WITH COCOA NIBS, DARK CHOCOLATE WITH PEPPERMINT CHIPS and DARK CHOCOLATE WITH SWEET ORANGE PIECES. Sold as set. 3 chocolate bars weighing 80g net each. Direct deposit or Paypal. We send with Australia Post or courier.